Southampton vs Chelsea is this Sunday’s early–afternoon Premier league action with the visitors boosting a undefeated record. The two teams have fared differently so far this season, at opposite ends of the table. Chelsea have won five and drawn two of their seven outings whilst the Saints have only managed the one win, two draws and four losses. Chelsea are clear favourites for this one, priced at 8/13 by SkyBet. Maurizio Sarri has given new life to Chelsea as their recent performances have shown. Their two recent matches both against Liverpool have made a statement that they can be title contenders; winning one and drawing the other. Eden Hazard has been in tremendous form since the birth of the season. The Belgian is the league’s top scorer with six goals and two assists already. Clearly on top form, SkyBet are offering 4/1 for him to break the deadlock – very good odds. Chelsea have also become much more rigid at the back. They have conceded five goals so far this season and only twice in one match. Great odds on Chelsea to win to nil at 7/4. Southampton haven’t had the best of times so far this season. They are currently 16thin the table with one win from seven. SkyBet have priced them at 9/2 to cause an upset this Super Sunday. One promising sign for the Saints was the addition of striker Danny Ings from Liverpool. Ings has netted three of their six goals this season and is 9/4 to score anytime this weekend. Their lack in depth is a worrying sign however and could see them really struggle this weekend. The referee for this match will be Craig Pawson. Pawson has not been shy at all this season, averaging 55 booking points in his 5 Premier League matches. The highest of any other referee. Southampton vs Chelsea will be televised live in the UK on Sky Sports Premier League HD and kicks off at 14:15 GMT. 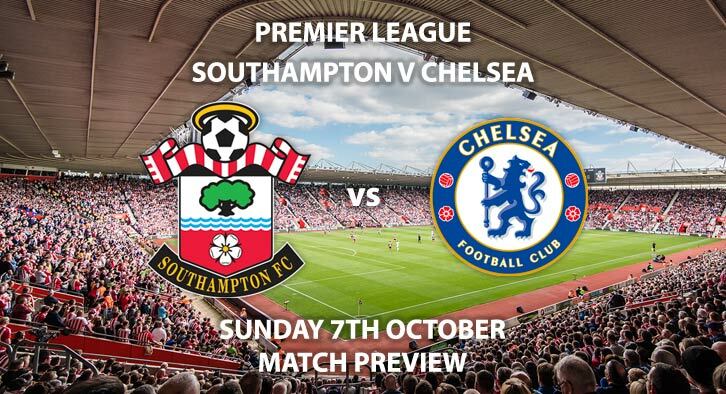 Prediction: Southampton 0 – 2 Chelsea. – This should be a routine victory for Chelsea. Their attacking prowess will be too much for Southampton’s defence. Correct score: Chelsea to win 2-0 – (link no longer available). First Goalscorer – Eden Hazard – 4/1. Correct Score Group Betting – Chelsea win 1-0, 2-0 or 2-1 – 7/4 – (NAP). RequestABet Specials – 33/1 to 66/1 – Over 3.5 goals, Over 12.5 corners, Over 45 booking points. – 33/1. Odds and markets last updated on Sunday 7th October 2018 @12:00 GMT.